Watch sailboats ply the bay from almost every window. 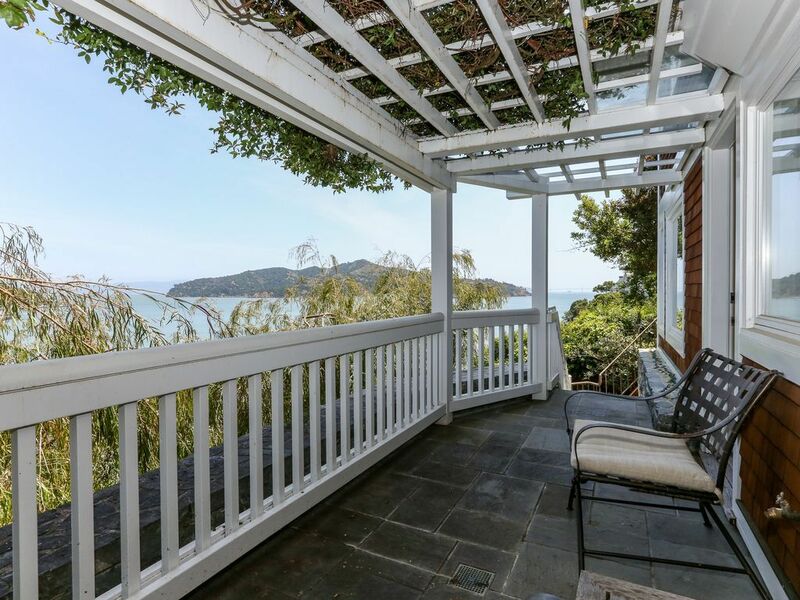 Walk to shops, restaurants and Marin's premier yacht clubs. Ferry to San Francisco. Start a hike from your front door. Or read a book from a cozy window seat overlooking the bay. This house has it all. 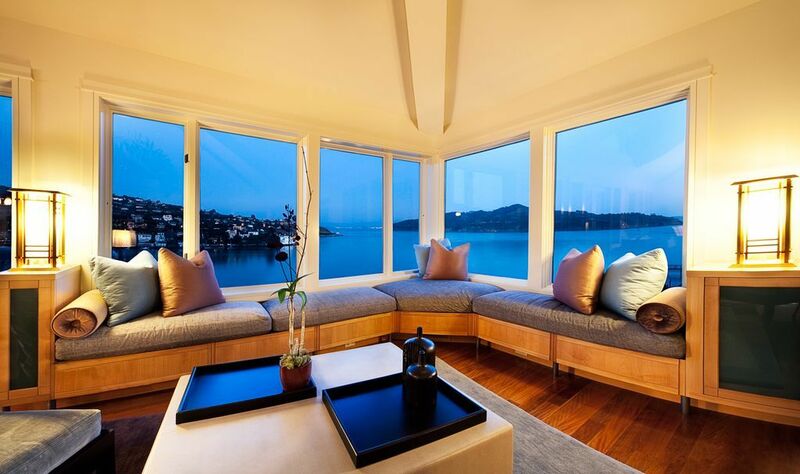 From the moment you first step inside the house, the views will take your breath away. They can't be captured in pictures! 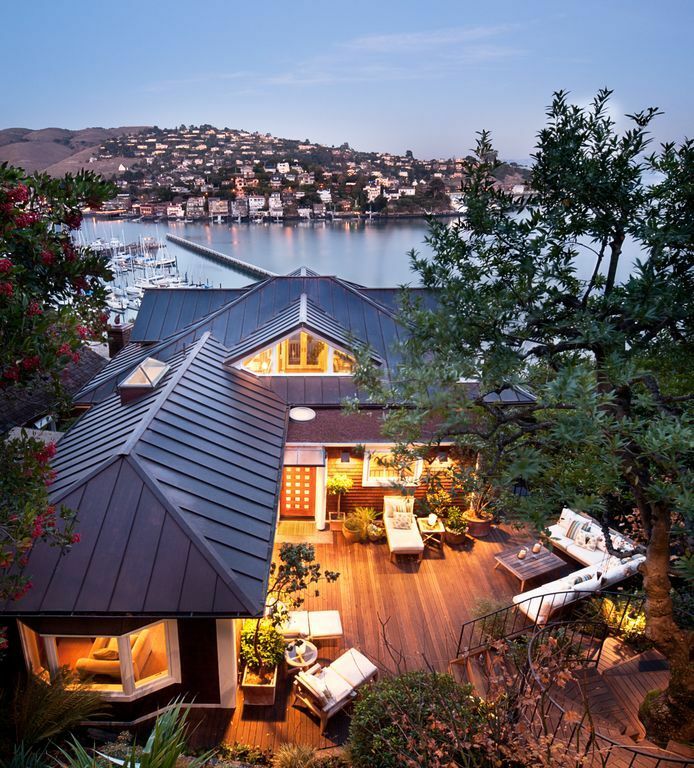 The house seems to float above the bay and every room captures the incredible views of Tiburon, Angel Island and The Bay Bridge. Seals lounge on the rafts just off shore and sailboats and ferry boats ply the waters below. Open the double doors onto the small, cantilevered deck and the ocean breezes will waft in. The house has been completely remodeled. The main floor (top floor you enter on) features a large private deck with BBQ and comfortable sectional couches and seating. The den opens onto it creating a great indoor/outdoor room. The great room (over 1200 square feet) has the living room, dining room, kitchen and seating area. 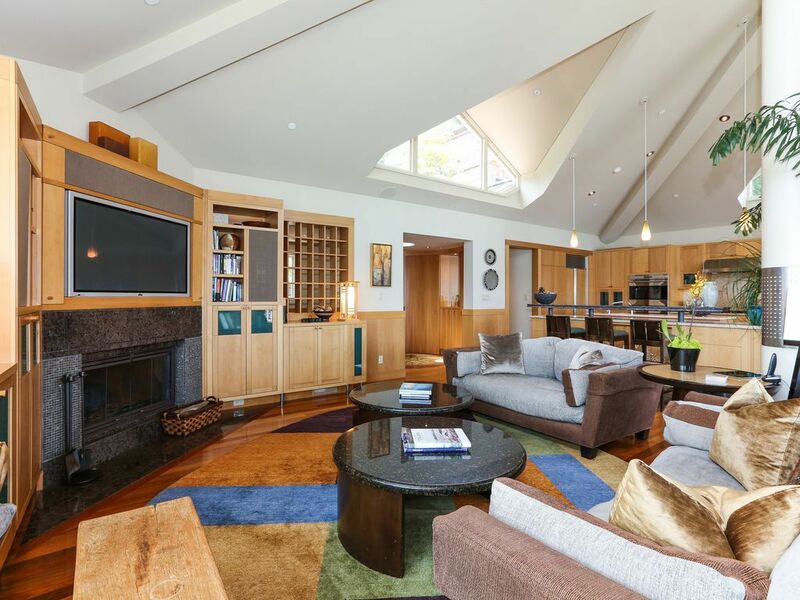 It has two walls of windows that captures the dramatic bay and bridge views and has 4 large dormer windows that bring additional light and forested views into the 15-foot-tall cathedral ceilings. This room also has the wood burning fireplace and 50' plasma TV with incredible surround sound. The custom cabinetry in the great room rivals the beauty of the view outside. Built-in window seats provide comfortable places to sit or lounge and enjoy the sun and views or read a book or watch a movie. The kitchen has all the appliances and serving wear you would need. 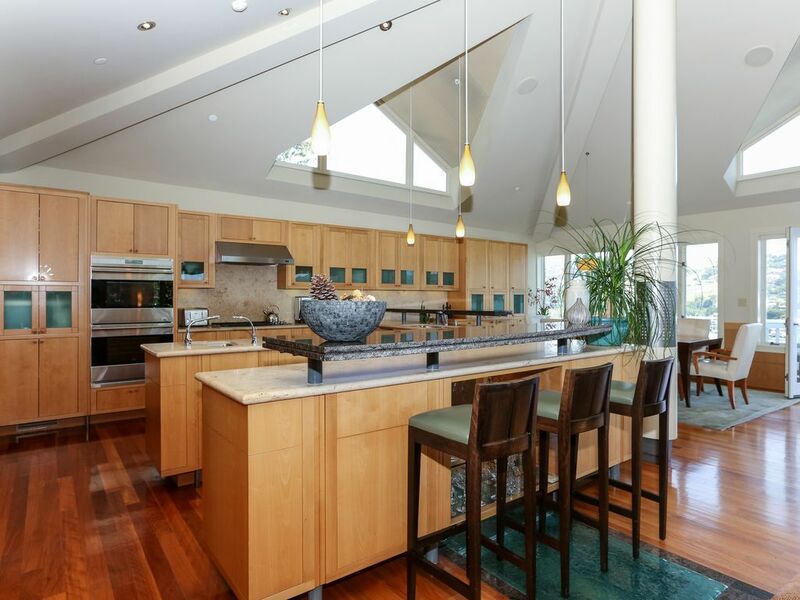 It is part of the great room so you can cook while enjoying the setting and incredible views. A crushed glass floor that slides under the bar lets light into the landing on the floor below. 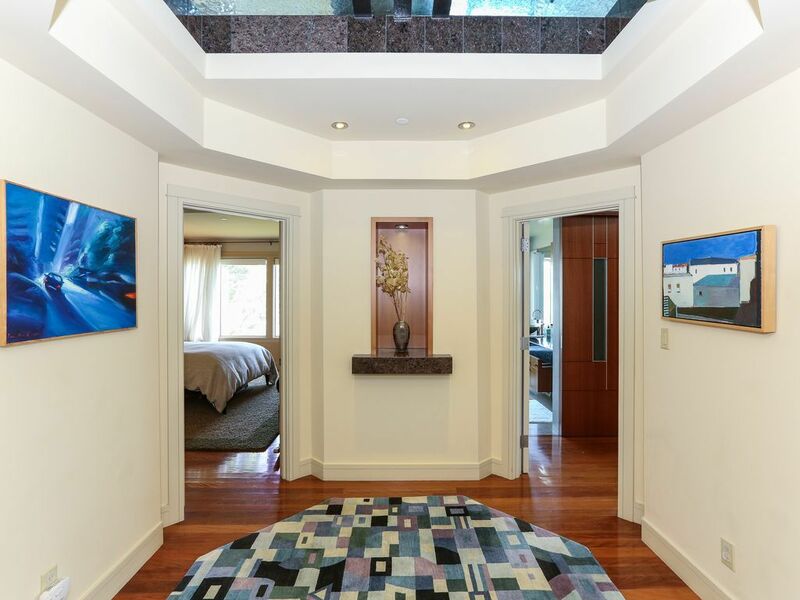 Take the stairs down to the lower level for the 3 large bedrooms plus private office. You arrive at the octagonal landing. Sunlight off the water reflects from above, shining through the glass ceiling and makes this room shimmer. Off of this landing are the three spacious bedrooms. 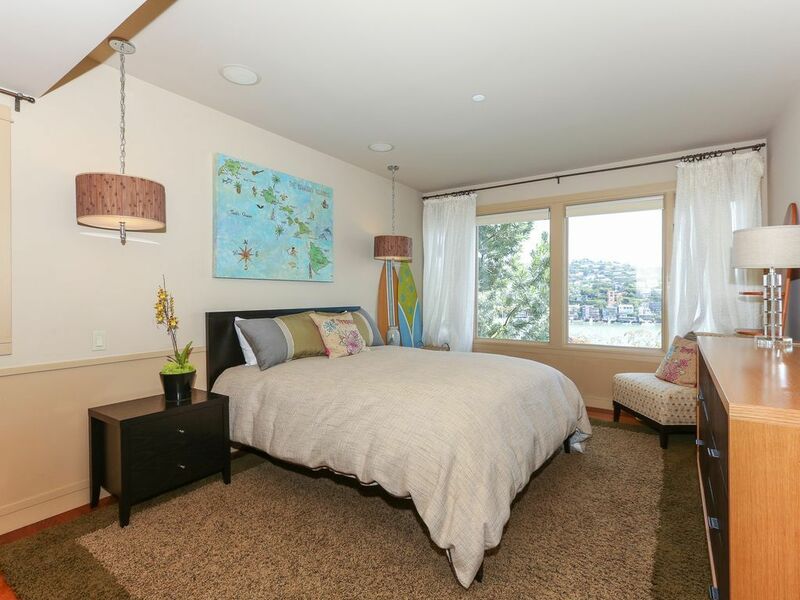 The large guest room (with queen bed) is decorated as a girl's room and has a wall of windows that enjoy the bay views. 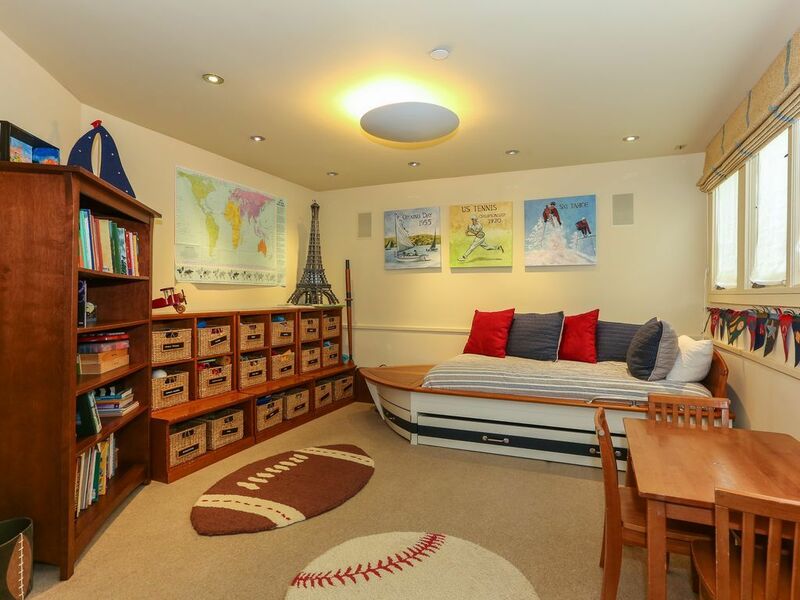 The other child's room is decorated with a sports theme and has a wall of toy bins. It has a twin 'boat' bed and another twin that rolls out from under it. 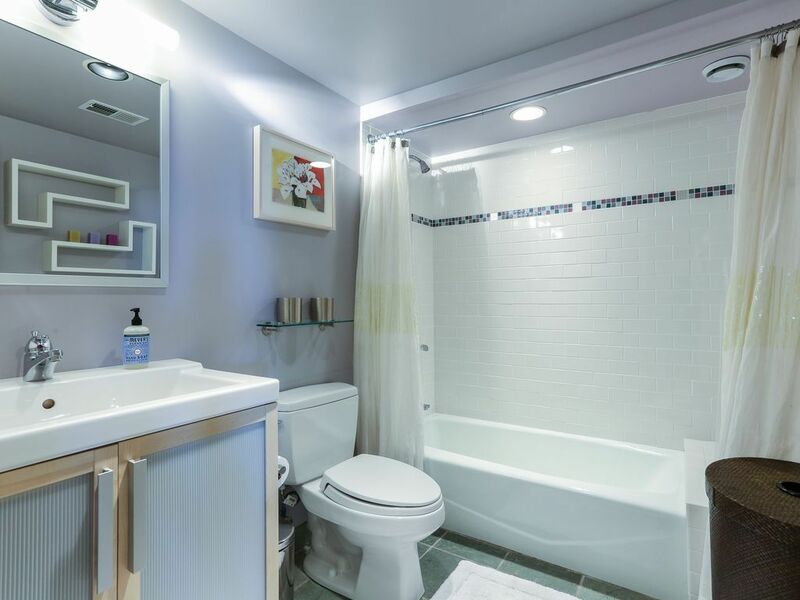 The guest bathroom on this floor is reminiscent of a luxurious spa with iridescent glass tiles, deep tub with jets and custom cabinetry. 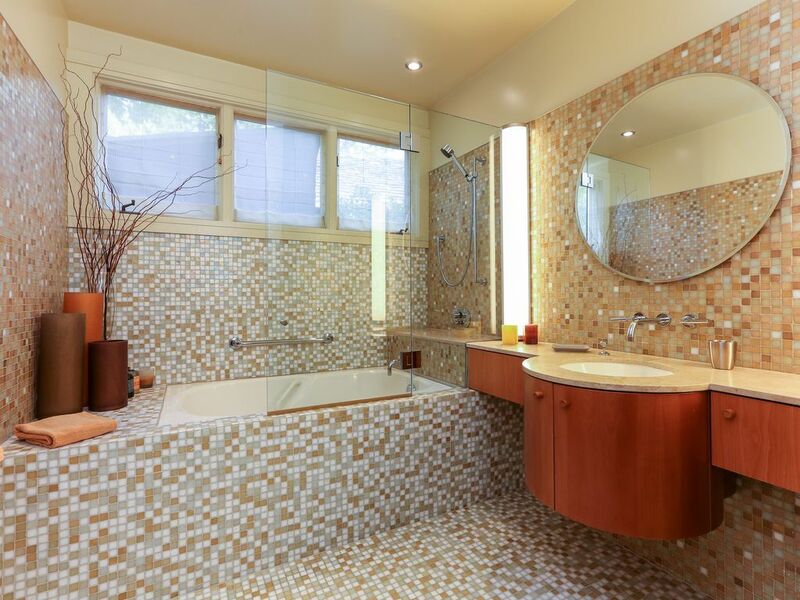 It was featured on the 2006 cover of Sunset Magazine's 'Before and After Bathroom Makeovers' book. 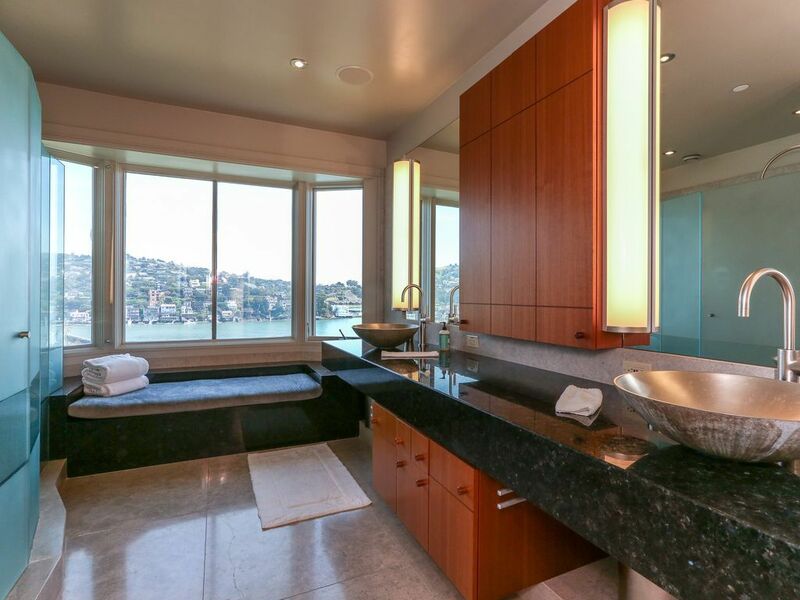 The powder room on the first floor is equally dramatic with its rough granite slab and custom cabinetry. 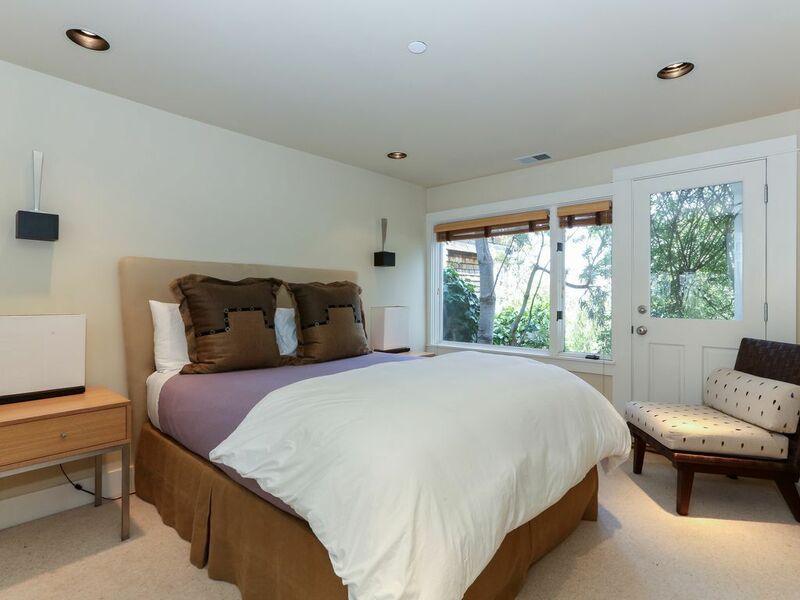 The master suite is luxurious and serene. 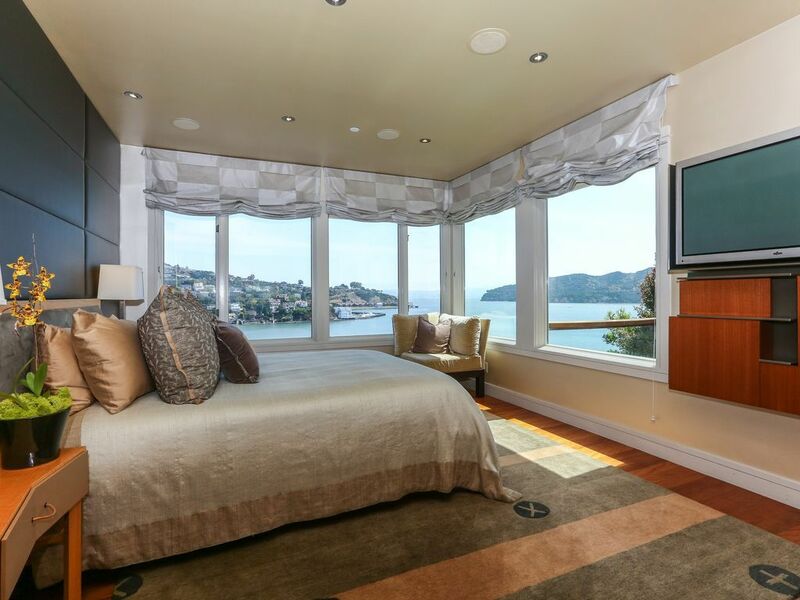 The custom queen bed floats in front of a padded wall surrounded by views of the bay, Angel Island and The Bay Bridge. The non-windowed walls hold the plasma TV (with built-in surround sound) and the wall of beautiful custom cabinetry. Listen to the waves gently lapping at the shore as you sleep. 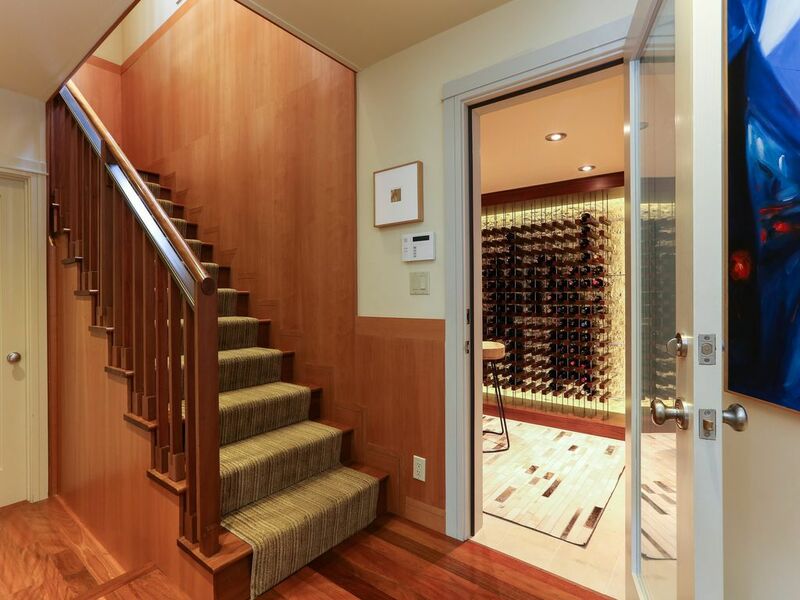 Custom hand-made wood and glass doors slide to reveal the office and walk-in closet. The custom cabinetry in the master suite is all made of rich African hardwood. The office looks out onto a small private garden and contemporary sculpture. Through the master bedroom it captures the views of the bay as well. The master bathroom has cabinetry of the same wood but is primarily filled with limestone and granite. The light limestone wraps the entire room and large shower while the dark granite makes up the counter and window seat that slides through the frosted glass divide into the shower. The shower includes a rain shower and body jets. The water closet is enclosed for privacy. 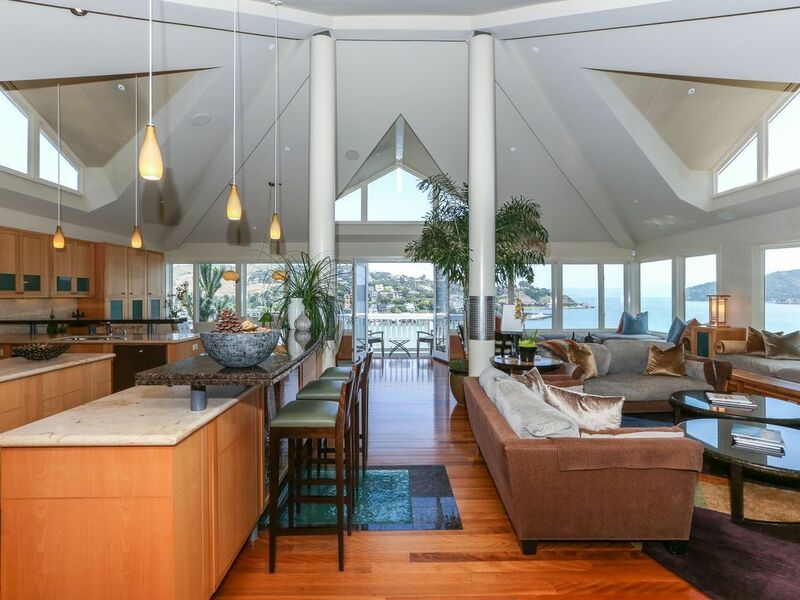 The gem of this room is the bay window overlooking the dramatic water views. 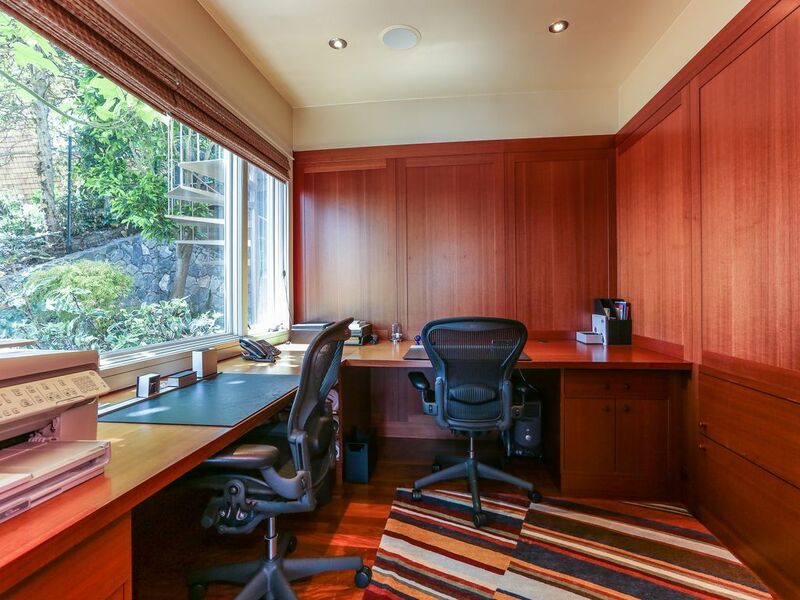 If you feel a little over exposed, you can flick a switch, and the windows will instantly fog over giving you privacy. This bathroom was featured on Home and Garden TV (HG TV's) Dream Bathrooms in 2008. 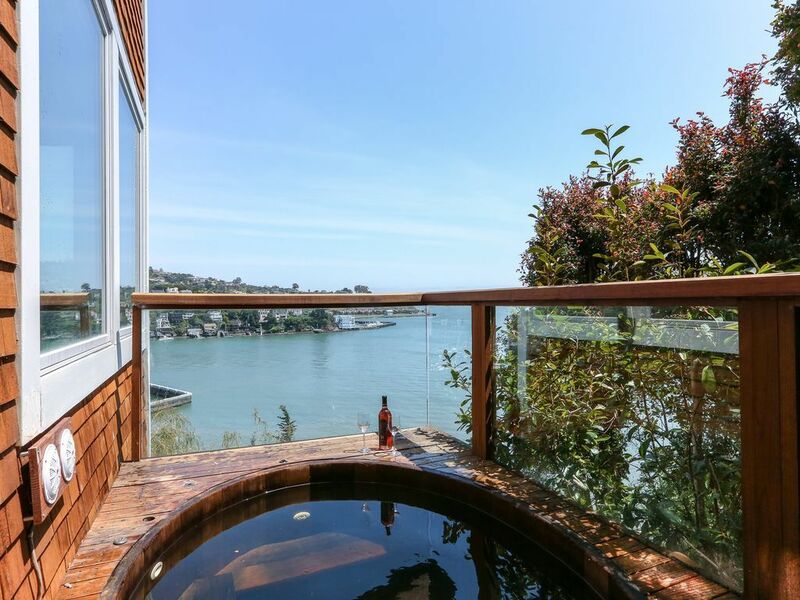 The deep cedar hot tub is located off the master bedroom on its own deck overlooking the Bay. Spiral steps from this deck lead up to the main deck and other steps lead down to the attached apartment below and to the lower street and town. The house has DSL and WiFi, Surround Sound and high definition TV, DVD and DirectTV (with all the movie and sports channels) in the great room and Master bedroom. A state-of-the-art sound system allows music to be played anywhere in the house and on the main deck. If you have your own music on your iPod, it will play throughout the house as well. 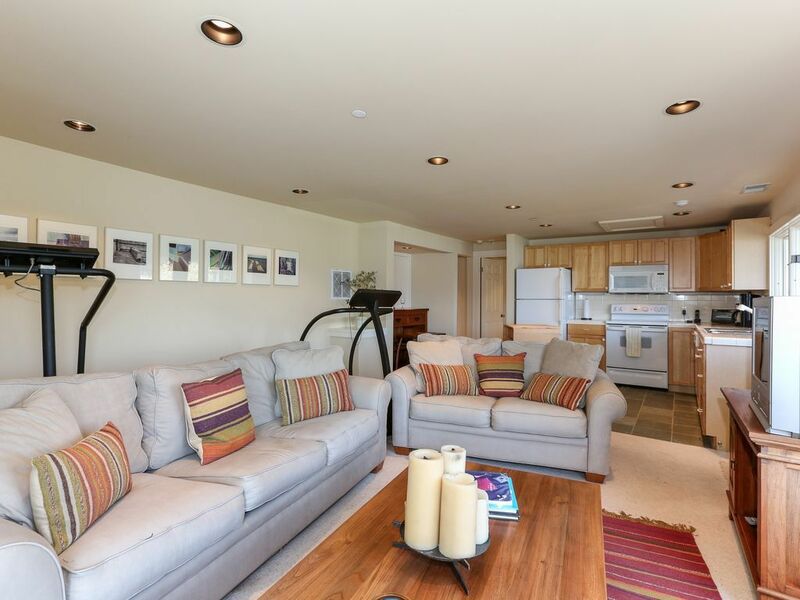 The apartment is approximately 900 square feet and has its own kitchen, bath, washer/dryer, living room and large deck-- all with the same great views as the house. It also has a treadmill and a Stairmaster for exercising. While the apartment is not designed to the same architectural standards as the house, it is lovely and very comfortable. The bedroom has a queen bed and the living room has two sofas, one which pulls out to a queen sized bed. Great for when a child or another family comes to visit-- you can be close but still have your privacy. Guest membership in our nearby swim and tennis club (Tiburon Peninsula Club) is available for $25/week for adults and $15/week for children. It features 2- 25 yard lap pools, a warm children's pool, a toddler pool, hot tub, 12 beautiful tennis courts nestled in trees at the base of the Tiburon hills, a large workout facility, lunch and dinner service, exercise classes and poolside cocktail service on weekends. Everything you need to relax and/or get in shape! If you are a member of a yacht club, you can use either the Corinthian or San Francisco Yacht Clubs which are short walks away. House cleaning, gardening and indoor plant services will take care of the property while you visit. Come take a trip to paradise! My family just returned from a week at this wonderful home. The view is spectacular....and the home is beautiful. We had 4 adults and 4 young adults in our group. The main house is spacious, very comfortable, clean and well maintained. The lower level guest house easily accommodated the young adults. We enjoyed the ease of getting to San Francisco as well as wine country. We would definitely stay here again if we get back to the bay area! We had a wonderful time at your home in Belvedere. Thank you so much for sharing it with us! Truly amazing location and home ! Beautifully home and location, my family and I enjoyed our stay while visiting my daughter. The house had everything we needed and more than enough space for everyone. The views are amazing, we hope to stay here again in the future. Thanks again Vince and Amanda, we enjoyed every second ! Our family of five stayed here in June and we could not have been more please with the home, the area and our experience. I was working in SF most days, and it was close enough to easily commute into the city, but while in the home we felt like we were in another world. The views are absolutely stunning. Hard to imagine a home having better views. Marin in general and Belvedere in particular are wonderful. The home is also wonderful. The owners have wonderful tastes - clean and modern but also very warm and comfortable. 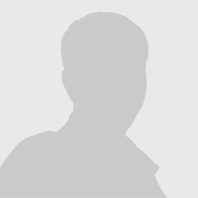 The home and decor are first rate, very well designed, constructed and maintained. This is not a rental house but rather a wonderful private home that we were fortunate enough to stay in. Everyone in our family, including the kids really loved the home. The owners make the experience complete. They were wonderful hosts in that they are very organized prepared and thoughtful. While it is their private vacation home, they leave it exceedingly clean and empty of their own personal things, so you get the best of both worlds; a homey vacation spot that feels like your own. We cannot say enough good things about this home, our stay or the owners. Staying here was an absolute treat! Our family of 9 had a most wonderful time in this gorgeous home. What can I say that other guests have not? The view is unbelievable, the location fantastic, the home spectacular, the owners as sweet and helpful as can be! Everybody had such a wonderful time on our family vacation, largely due to this amazing place. Thank you again Amanda and Vince, for sharing your truly wonderful home with us! Everything from working with the property owner, to our stay, to the deposit return was exceptional. This home was recently remodeled with an intense focus on the details and abundant caring and love - it's obvious when you stay thee. Every day I would notice additional details that make the place extraordinary. The views are amazing, the walk into tiburon is easy and fast. The hill elevator is awesome for loading / unloading groceries. Would definitely stay again! Our daughter was married at Old St. Hilary's Church on May 10, 2014, the day before Mother's Day and two days after her Dad's birthday. Our planning for the Tiburon wedding was uncomplicated except for our inability to find area hotel accommodations suitable for all the planned events. Since most of the guests were from out of town, there really didn't seem to be a good place to get everyone together for the several events planned without being boring! So our daughter decided to look for a house in Belvedere. Wow! What a find! Besides the jaw-dropping view, the open floorplan in this home seemed to have been designed exactly for the purpose! Large, spacious and very well furnished, the home has sufficient seating for a small crowd (although most of our guests weren't sitting but rather gazing out the expansive windows at the view)! The bedrooms are on the lower level and provided an excellent private area for bridal preparation. The kitchen and dining area was perfect for the caterers to prepare and serve while being unobtrusive. All in all a perfect choice for our special weekend! Even the photographers were ecstatic, since there wasn't a single photo that failed to reveal the beauty of the venue or the special event! The home is a short walk from town so everything is very accessible. The home is located on a rather steep hill, so there are two sets of stairs (one from above and one from below) that are manageable for the physically fit but not for the elderly or infirm. Don't worry, there is a Hill-a-vator (an "attraction" for some of our guests) to get everyone to and from the view!! There is little room for parking but the garage held a sport utility and there was one off street parking spot for a standard size vehicle (it was a squeeze for the mini-van we rented). These are NOT detriments if you have planned ahead! The owner was delightful and met us at the home the morning after we checked in to show us around. But by that time, we had explored, found the private apartment below the main house, and made ourselves quite at home!! There are many fond memories of a wedding. One if them will surely be this wonderful home away from home! 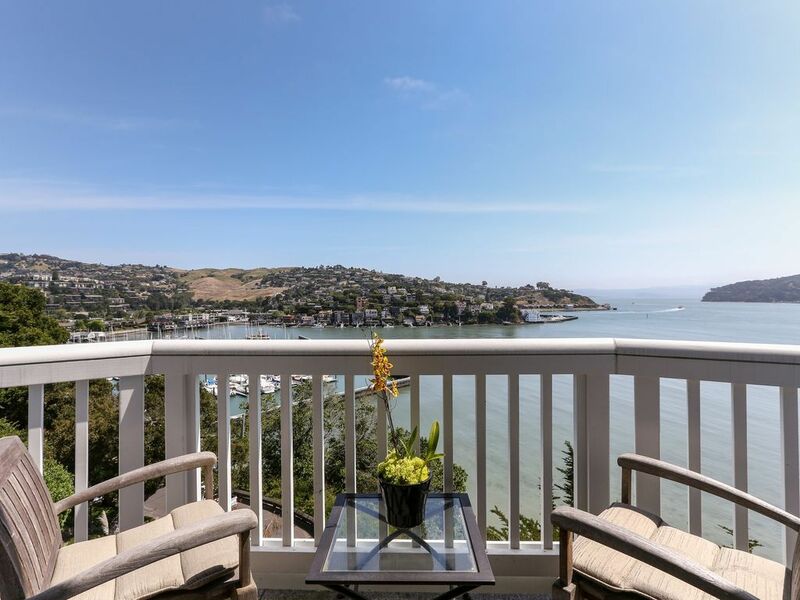 This place has it all… breathtaking view of Tiburon and Angel Island, contemporary furnishings, and a great location that’s minutes away from the Tiburon shops, restaurants and ferry. The owner personally walked us through the house. Everything was spotless. During our stay it was very easy for our family to decompress. When we finally got motivated to travel outside the immediate area, wine country was a short ride away, as was all of the San Francisco attractions. We highly recommend staying at this home and eagerly await our next visit! We spent the Christmas season of 2009 in this awesome contemporary home. We were 7 adults and 2 children and there was ample room as we used the fully furnished and equipped apartment. 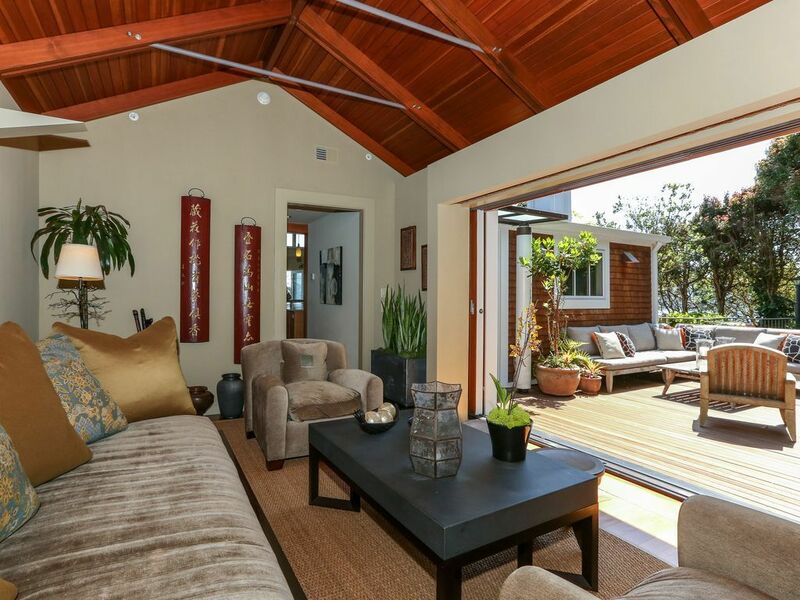 This home is close to world premier wine country (Napa and Sonoma) and a short drive to San Francisco and all that fabulous city has to offer. 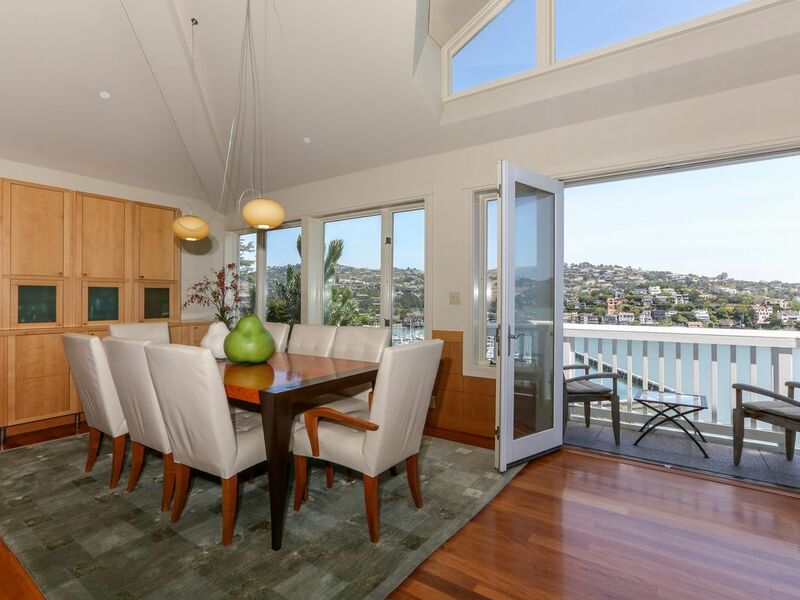 When you enter the great room (15 foot ceilings and walls of windows) you have to catch your breath--fantastic views of Angel Island, the Bay Bridge, San Francisco Yacht Club Harbor and all the ocean and sea life. Inside the view rivals the exterior views with all the custom pear wood cabinetry, use of sandstone and granit plus beautiful, tasteful and comfortable furnishings. Everything about this home is a architectural delight. The guest bath was featured on the cover of Sunset Magazine and the home on HGTV. There are plasma TV's, DSL, and WiFi along with a state of the art sound system throughout the house and outside patio area. There is a guest membership available for the Tiburon Peninsula Club that is terrific for adults and children. This is a very clean and well maintained home with house cleaning, gardening and indoor plant service. Master suite has wonderful top of the line Italian linens. Plush linens are provided for the other bedrooms. The home is fully equipped with everything you need. The owners are charming, delightful and want everyone to enjoy the home and have a wonderful time. For a piece of paradise we recommend this fantastic home. This is an incredible home that sits in an idyllic setting nestled into the Tiberon hillside. Everything about it is amazing - from the wonderful large wood deck, great room with breathtaking views, awesome kitchen, latest technology electronics - even the bedding/linens are 5 star! 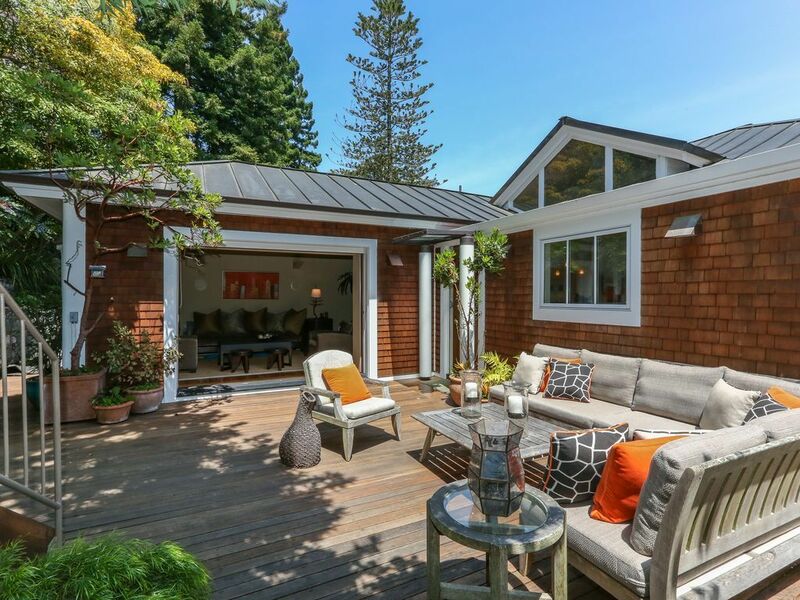 It's a peaceful magical place and perfect location for day trips to wine country, SF and other quaint nearby towns like Mill Valley and Sausalito. It is hard to believe it's a rental! We will definitely be back! The minute we arrived at this home, the views really did take our breath away! Everything about the home is absolutely gorgeous and it is obvious that the owners thought of every last detail when remodeling the home. The great room is enormous — our favorite spot was the window seat overlooking the bay, but there were so many spots in the home we loved, it is hard to pick the best. We were surrounded with beauty — from the custom furnishings, art work, high-end linens and towels inside...to the gorgeous view and beautiful gardens outside. The town of Belvedere is reminiscent of an Italian coastal village — there are quaint one lane roads all over the place and you can take secret staircase walks to explore the rest of the “island.” You can walk to the town of Tiburon in 10 minutes for shops and restaurants, and the swim and tennis club is also a short walk away. If you want to go to San Francisco or Angel Island, the ferry departs right from town. The owners were very friendly and helped answer all our questions about things-to-do in the area. We cannot wait to go back to this incredible home! We recently stayed at this home for two weeks in March. My family of five, mother-in-law and visiting cousins from SF all loved the home (including the apartment). It is very comfortable, beautifully decorated and well equipped for all that you would need including an amazing sound and entertainment system. We took advantage of the local fitness club which my children thoroughly enjoyed - pools, gym and basketball court! 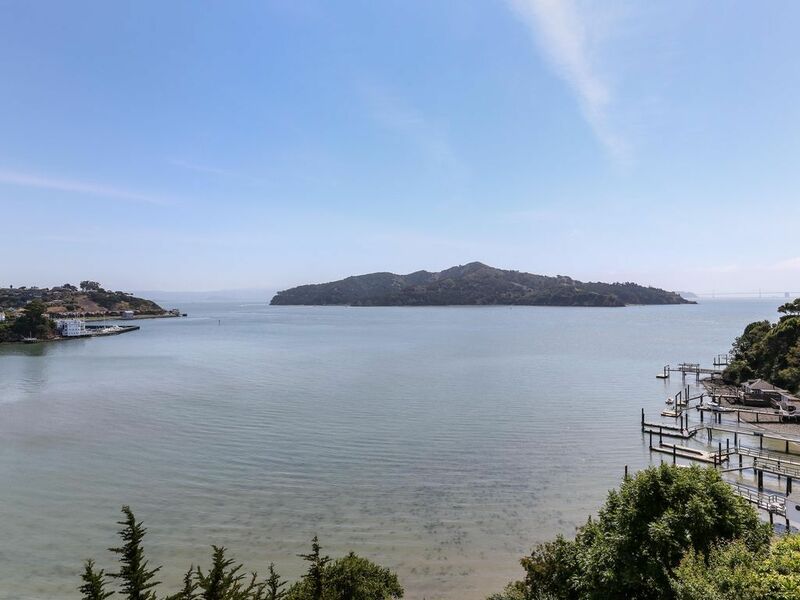 It is within walking distance and the town of Tiburon is also a short walk away. The owners were very accomodating and did everything possible to make our stay enjoyable. We loved it so much that we hope to return in 2011. My family of four has stayed here for the last two summers and nothing compares to this home. The views are stunning and the house invites relaxation. The whole house, while beautifully done, is extremely comfortable and the surrounding town is tranquil and secluded. There is no better vacation spot. We stayed here last summer and it was spectacular, very comfortable, top shelf appliances, parking, but most of all the views. I would come back for certain. Very clean and perfectly located to avoid weather.